This is lesson four of a 10 ten-lesson course, Simple CodeIgniter App, which walks you through the creation of your first PHP web application using the CodeIgniter framework. Before we jump into any writing code for our web app, it’s important discuss some of the basic concepts of programming in general. And since we’ll be using it to write most of our app’s code, we’re going to use PHP to help demonstrate all of these concepts. PHP is great to use as an example as it contains almost all of the common abilities shared nearly universally between the great majority of programming languages in existence. PHP lets you easily perform common tasks, such as mathematical operations, date and time calculations, and much more. with the * representing the multiplication operator (which is the case in almost all programming languages, by the way). Remember, as mentioned in a previous lesson, all blocks of PHP code must be surrounded by opening, <?php, and closing, ?>, PHP tags. With that said, any number of lines of PHP code can exist within those opening and closing tags. So, for example, (as you’ll see later on) if we have an entire file filled with only PHP code, we only need one opening tag at the very beginning of the file and one ending tag at the very end. Now back to our code. Just running an isolated calculation like 8 * 4 doesn’t do us a whole lot of good. Thankfully, PHP allows us to store pieces of information in variables. Variables are named placeholders that allow us to reuse information throughout our code, simply by referring to them by name. Note that when defining a variable in PHP, its name must be preceded with the <em>$</em> symbol. Additionally, all variable names must be just one word, without spaces, containing only letters, numbers, and underscores, _. Additionally, the name must start with a letter. So, for example, <em>$result</em>, <em>$this_result_2</em>, and <em>$this_3rd_result</em> are all valid variable names in PHP. Comments can be added as a way to describe a piece of code and are created by preceding a line with a double forward slash, //, as shown. Note that comments are not considered as actual lines of code, and they won’t ever have any effect on the code, itself. They’re simply there to make it clear— to someone else who may be reading your code (or to remind yourself)—as to what the code should be doing. which is known as a block comment. Very frequently when building our app, we’ll be using PHP to print out pieces of information in amongst HTML code. To accomplish that, we’ll use PHP’s echo function. Frequently, when coding, you’ll write a group of code lines all designed to work together to perform a specific task. In PHP (as well as in all other programming languages), we’re given a very convenient way to organize such pieces of code: by defining functions. 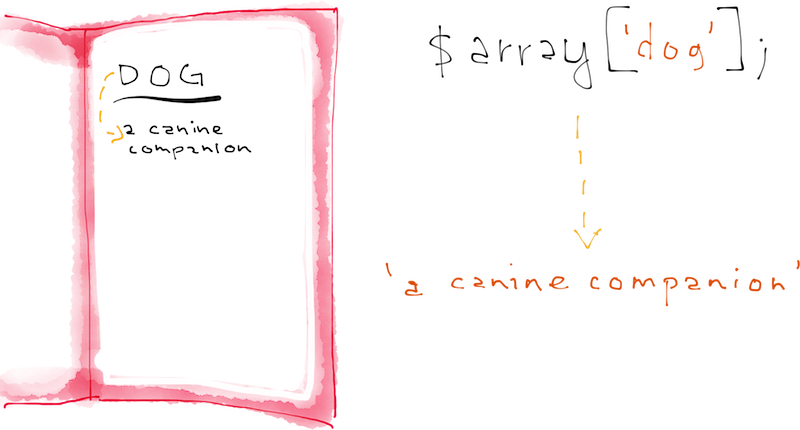 Notice that the above function accepts one parameter: $name. Parameters are used to allow us to pass required information into a function. In this case, our function does not work properly unless we pass it a name. by joining three strings: "My name is”; the value of our $name variable that was passed in ("Alex” in the example above); and the string containing just a period, ".”, to end the sentence. You also just saw the first example usage of string concatenation—combining multiple strings into one. In PHP, this is done using the concatenation operator, ., which, as you can see, is just a dot/period. Operators allow us to perform various operations, such as joining two strings with the dot, ., operator or comparing two numbers with greater than, >, or less than, < operators. Functions have the ability to send information back to the location in the code from which they were originally called. When they do this, it’s referred to as returning. All functions can either: a) return some sort of information; or b) not return anything. Both are used quite frequently—whether or not a function returns any information is totally dependent on the situation it’s handling. Let’s take two examples to describe when it may, and may not, be appropriate for a function to return information. In our first example, we have a function that’s used to print out the brand, model, and color of a car. echo 'I drive a ' . $color . ' ' . $brand . ' ' . $model . '.'. // The statement below should print "I drive a red Dodge Stratus." In this case, there’s no information that needs to be returned for further use; we’re simply printing out a string. Now let’s take a second example where we do need our function to return some information. Let’s say we have four numbers and we want to: multiply the first two together; multiply the last two together; and then get the sum of those two results. In the example above, you can see that our function does something rather simple: multiplies two numbers together. What’s important is the fact that it returns that result so that it can be stored in a variable and used at a later time. We begin with our four initial numbers. We then pass the first two numbers into our multiply_numbers function, returning that $result, and storing that value in our $first_times_second variable. Without that last return statement in our function, we would never have access to the resulting value, as it would never be sent back to the place in our code where we originally called the function. But with the return statement, we get the resulting value. We can then do the same thing for our third and fourth numbers, and finally, retrieve our $answer value by summing those two results. That’s generally good practice—defining functions before they’re called—but it’s not entirely necessary. When a PHP file is accessed, all of its functions are initialized before any of the other lines of code are executed. So as long as a function is defined in the same file, it can be called from anywhere within that file. This is also a good time to address a concept known as scope. 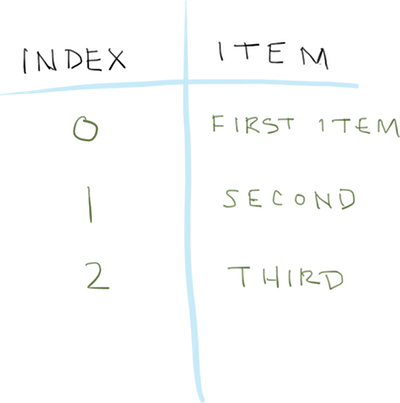 The scope of a variable refers to the domain within which it can be referenced. In the code above, we have a function, example_function, and within that function, we’ve define a variable, $function_var. The function’s code is completely valid. We define a variable and then return it. But below that, you see another statement, outside of the function, trying to echo the $function_var variable that was created inside of example_function. That line of code is invalid, as the $function_var does not exist outside of example_function. And that’s a perfect demonstration of why we require the use of return statements— to make use of values contained within a function outside of it. In programming, one of the most commonly used data structures (i.e. a particular way of storing or representing data) is the array. An array is used to store a group of associated values, together. And as you’ll see as we progress through building our app, they’ll become extremely useful in all sorts of different situations. Let’s look at an example to see how arrays function. In this example, we’ll be using an array to store a group of numbers. 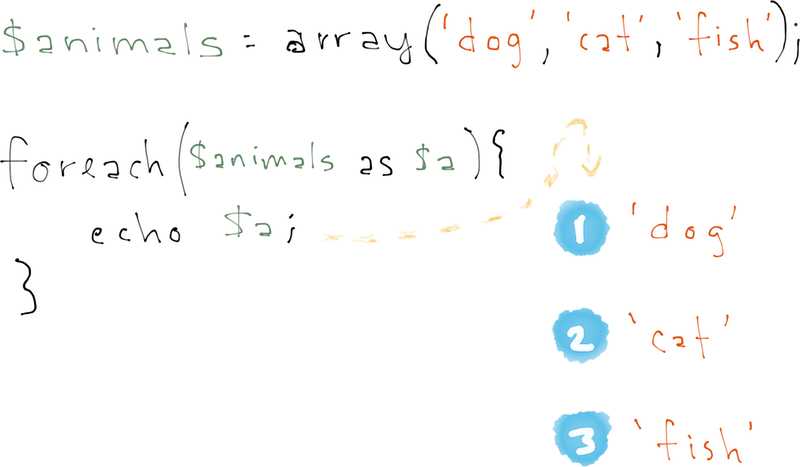 where $array_name is the name of the array variable, immediately followed by open- and closed-brackets, , followed by the equals sign and the value you wish to add to the array. The values you wish to include in the array are simply included within the array function’s parentheses, separated by commas, as seen above. And we’re not restricted to a certain number of values; we could create an array with 50 or even 500 initial values, if desired. In PHP, arrays act, essentially, like dictionaries: you add an item to the array and assign it an associated key, so that you look the item up by that key later on. In an actual dictionary, you have words and their associated definitions; in arrays, you have keys and their associated items, or values. Note that this is very similar to a dictionary: you know a word (i.e. the key), say “computer”, and you can look up its definition (i.e. the value) by locating it in the dictionary, as depicted below. Frequently—in all kinds of programming, including web development—we need to either: 1) perform a very similar operation, many times in a row; or 2) iterate, or cycle, through a collection of items—such as an array—and perform a certain function on each item. To accomplish that, we can use what’s known in programming as a loop. As you see above, we start off with our initial array of numbers, $our_numbers, as well as a new, empty array, $our_numbers_roots, which will store the square root values we’ll be computing. We then utilize a foreach loop to cycle through all of our numbers. foreach loops allow us to take an array of items and go through each one, starting with the first one and automatically ending with the last one. and a variable that represents the current item, which can be named anything of our choosing (as you see in the example above, we used the variable named $num to represent each individual number as we looped through them). The process of looping through an array’s items using a foreach loop is demonstrated in the figure below. In PHP (and again, nearly all other programming languages) we also have what’s known as a for loop, which functions slightly differently than our foreach loop. after each loop, increment $i by one ($i++, which is the same exact thing as $i = $i + 1)”. That means that our loop will run the first time with $i equal to 1. After that, $i will be incremented by 1—updating its value to 2—which is still less than 12, so the loop will run again. And so on, all the way through $i being equal to 12. After that, $i will be incremented and set to 13, and our condition, $i <= 12 will return false, thus exiting the loop. You can see how this loop works perfectly for generating a list of numbers in order. You now have a solid background of some of the most important, fundamental concepts in all of programming: variables, functions, arrays, and loops. And we’ll continue to use all of these concepts throughout the remainder of the course as we build our web app, so feel free to refer back to this lesson as often as you’d like. Now it’s time to put your new knowledge into action. Write some PHP code of your own that utilizes variables, functions, arrays, and loops. Now that you have an understanding of these four coding concepts and have seen multiple examples of each, it’s time to write some code of your own that puts them to work. After working through the previous lessons, you should already have your computer set up for writing PHP code. Start by creating a new test.php file directly within your web root directory (C:wampwww for Windows; /Application/MAMP/htdocs for Mac), and open it up within Sublime Text. Create an array that contains a few names—maybe one that contains your name as well as a few of your friends’ names. And as always, feel free to send me an email or leave a comment with any questions you have or reach out if you get stuck. I’m always here to help!